There are countless medical conditions that can impact your health in a big way. If your blood sugar levels are too high, this could result in you being diagnosed with diabetes. Diabetes is a serious condition that can impact all areas of your life and can have a negative impact on your overall health. Insulin is the main treatment for high blood sugar levels, but it is possible to deal with diabetes through diet as well. No matter if you have type two or type one diabetes, it is essential that you get a handle on your diet. You need to know what foods you can still eat daily. 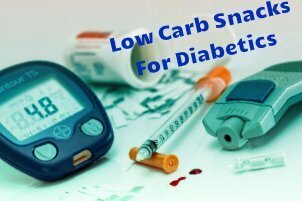 Snacking is a unique issue for a diabetic because they have to be careful about their blood sugar levels, but there are still great low carb snacks for diabetics that you can still enjoy. You need to think a little outside the box when you are snacking with diabetes. You can’t just reach for a bag of chips or a sleeve of cookies, because this will send your blood sugar levels rocketing out of control. You need to think of low carb snacks that are not processed and not filled with sugar. One great idea that you can give a try when you are in the mood for a snack is a graham cracker and grapes. You can make a really sweet snack by just taking a graham cracker and spreading cream cheese on it before slicing up grapes and placing them on top. Not only is this is a really tasty snack that you will enjoy, but it is also good for your diabetes. One of the go to snacks that you should always have on hand when you have diabetes is yogurt. Just be sure that you read the labeling and you only buy the plain yogurt that does not contain any sugar. This is the best yogurt to eat when you have diabetes. Plain yogurt might not be what you are craving, but you can make it taste better by adding fruits and nuts. It might not be easy to come up with the best combinations when you are trying to snack with diabetes, but pears and cheese are another combo you can’t top. They just go great when they are paired (pun intended!) together plus they are low in carbs and sugars, which makes them the ideal choice for people with diabetes.